They Came From Beneath The Sea! is a new game encompassing the wonder, horror, thrills, and hilarity of 1950s science fiction. This game will evoke all that is great in the B-Movies of decades ago, and provides a dynamic, fun experience at the table. They Came From is a tabletop roleplaying game in which the players, as humans, live in a world under increasing attack. The attackers? Aliens from beneath the sea, obviously. Adventures range from the one-shot defense of a small coastal town, to the lengthier liberation of a cruise ship infested with gill-kin, all the way to the campaign in which characters seize an alien submarine and ride it all the way down to the sea bed to take the fight to the invaders. In this game, the protagonists are strong-jawed war veterans, cunning and resourceful explorers, utterly insane scientists, and blue collar heroes, just looking to defend their patches of land. Aliens invade, but they’re not a homogeneous race. Far from it: this game will include scores of Threats, and they don’t get on. This game contains a mix of Enslavers, Invaders, Destroyers, Primordials, and Spies, all presenting a broad array of dangers and objectives for repeat play, and frankly, to cause confusion. 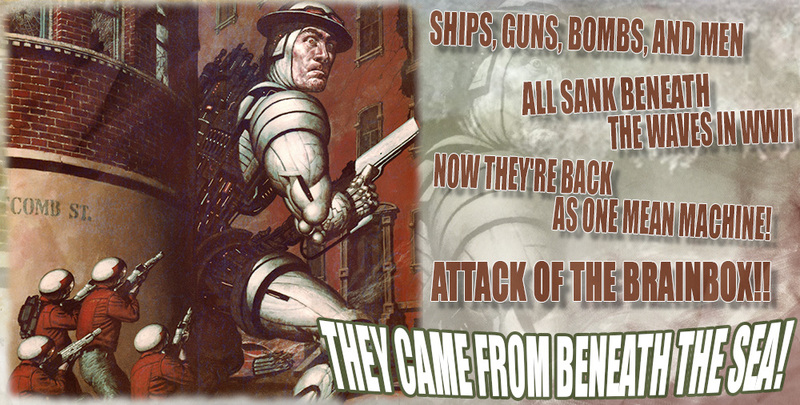 A part of They Came From’s charm is in its chaotic assembly of conflicting bad guys. Onyx Path Publishing will be launching the Kickstarter for They Came From Beneath The Sea! soon. Until then, keep watching the water! They [Q&A]me from Beneath the Sea! Now Available: Night Horrors: The Tormented in print!